World’s leading pioneers in food ingredients, manufacturing, production, processing, packaging and supply chain won key recognition at the debut Gulfood Manufacturing Industry Excellence Awards, held at the Armani Hotel Dubai, in Dubai, UAE. Held on the fringes of the ongoing event, the awards recognised best practices and innovation across the food manufacturing industry value chain, said a statement from the organisers. With Gulfood Manufacturing split into five distinct components – automation, ingredients, manufacturing, processing and packaging, and supply chain – the 12 core awards were distributed across the show’s quintet of sectors, it said. The ingredients awards comprised ‘Most Innovative Food Ingredient’ – won by Archer Daniels Midland (ADM) for Fruit Up Fiber, a low-glycemic and non-GMO ingredient for clean-label food, drink and snack developers; and ‘Most Innovative Health Food Ingredient’ – won by Novozymes for Spahera, a lactose-free, fermented dairy product, it added. European firms dominated the manufacturing industry awards, with ‘Major Plant Sustainability Initiative’ going to Barcelona-based Liven for its Green Energy Snacks line; Italy’s Elettric 80 scooping ‘Greenfield Facility’ for its fully-integrated and automated system; and Italy’s A Due Si Squeri Donato & Co. winning ‘Cost Waste Reduction’ for Niagara, a revolutionary water-saving technology. “This is a milestone achievement that recognises our efforts in saving water – our planet’s most valuable resource - for a sustainable future,” he said. Awards in the processing and packaging accolades went to Tetra Pak, which won ‘Distributor and/or Integrator’ for its customised automation solution, Plant Master; ‘Packaging Design’ was claimed by Germany’s VF Verpackungen; and the hotly-contested ‘Processing Innovation’ gong went to Dutch firm Log5 for a new-to-market dry food pasteuriser. 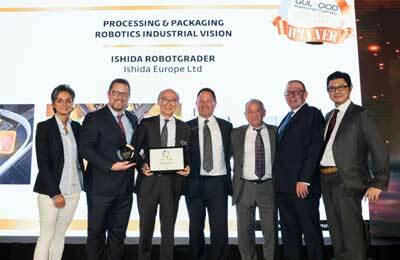 The category’s big winner, however, was industry heavyweight Ishida, which took home the ‘Product Protection’ and ‘Robotics Industrial Vision’ awards for AirScan, a leak detection system, and Robotgrader’, which allows for fixed-weight packing for fresh poultry, meat and fish, respectively. “We look forward to continued success and extend our winning streak next year,” he said. The supply chain categories included two awards: ‘Best Commercial Vehicle – Light Heavy’ went to Ford Motor Company for its refrigerated Transit Custom vehicle, while Transveritas Foodstuff Trading scooped ‘Supply Chain Innovation’ for its intermediate bulk containers, Goodpack.